I am working through a scenario to select and rate Board Games to help push me to learn more about the Power Platform. At this point we have selected a game and sat down to play. Obviously I won so I want to record a high rating for this game. My goal is to create a PowerApp I can run from my phone. 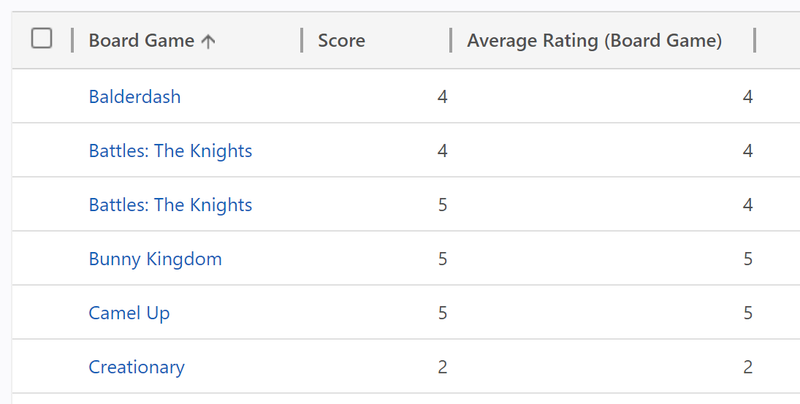 I will search for the game to view details and then add a new rating for played games. This rating will create a new "rating" record in D365. Then our rollup field will automatically update the parent Board Game record. So let's see if this works. 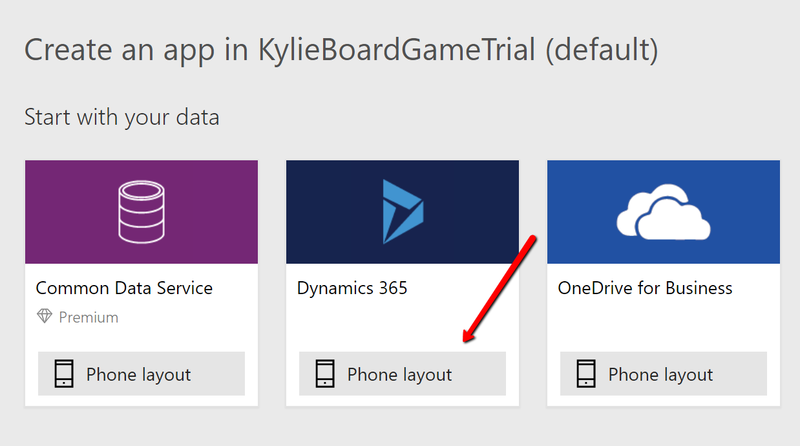 The PowerApp was a bit less intuitive (at least for me) than the Power BI dashboard. So I created several different Apps and forms/screens before getting what I wanted. The end result is not perfect but was achieving my goal of getting in and trying it out. 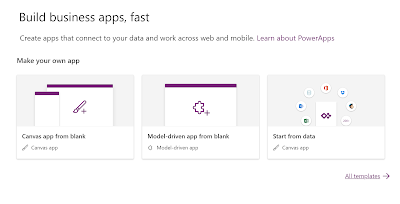 You start in web.powerapps.com and login to your org. 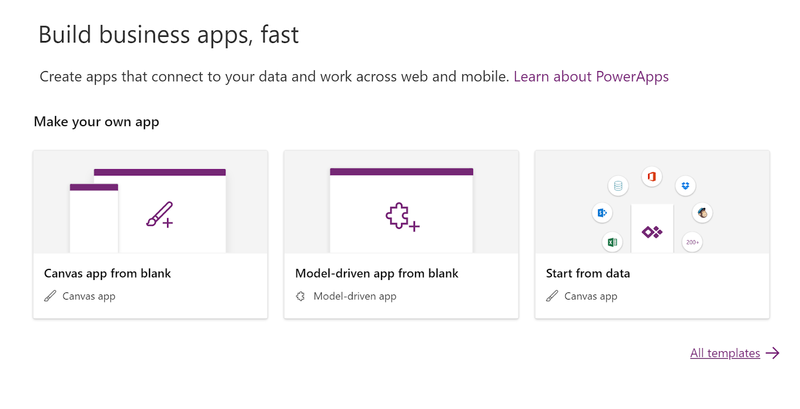 From here you can create a Canvas App starting from Data. 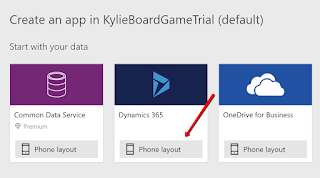 I selected Dynamics 365 and my board game entity. 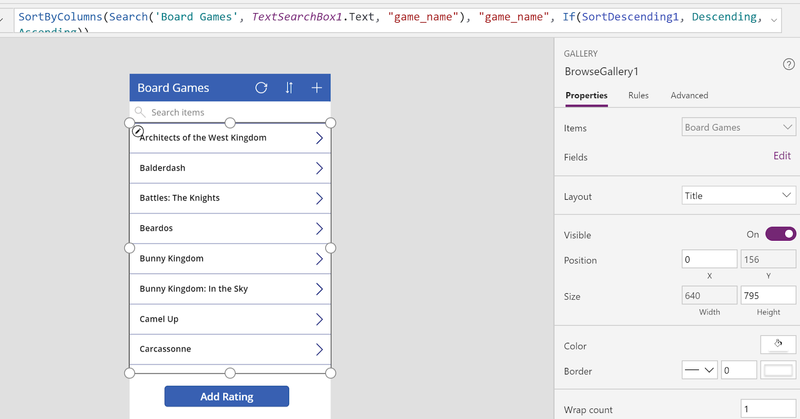 This automatically built a list screen where you can search the games and a detail screen to view all the details from the game. These screens can be edited using the options on the right hand side to add fields, remove fields, change layout, etc. Now, to create a new Rating record I created a new blank form page. I added a combo box to this page which links to the Board Game list and allows users to search and select one. Then added a Rating scale to fill in the star rating. Then I linked the submit check mark to a Flow. 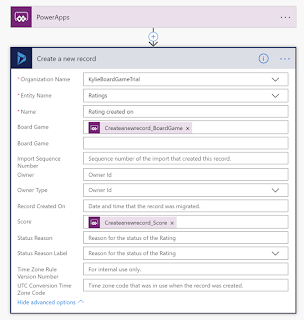 This Flow will push the data from the PowerApp form into Dynamics 365. Finally I created a new button on our main page to get to this Rating page. Additionally there were a few other navigation edits to make sure canceling goes back to the right page and such. The hard part for me was getting the right logic to send to the Flow which submitted the data. The main issue I had with this was making sure I had a blank form (no data source selected) and then making sure my combo box was only allowing one item to be selected. I would like to expand this by allowing someone to go to a detail form and add the rating from there. This can be a day 2 item. 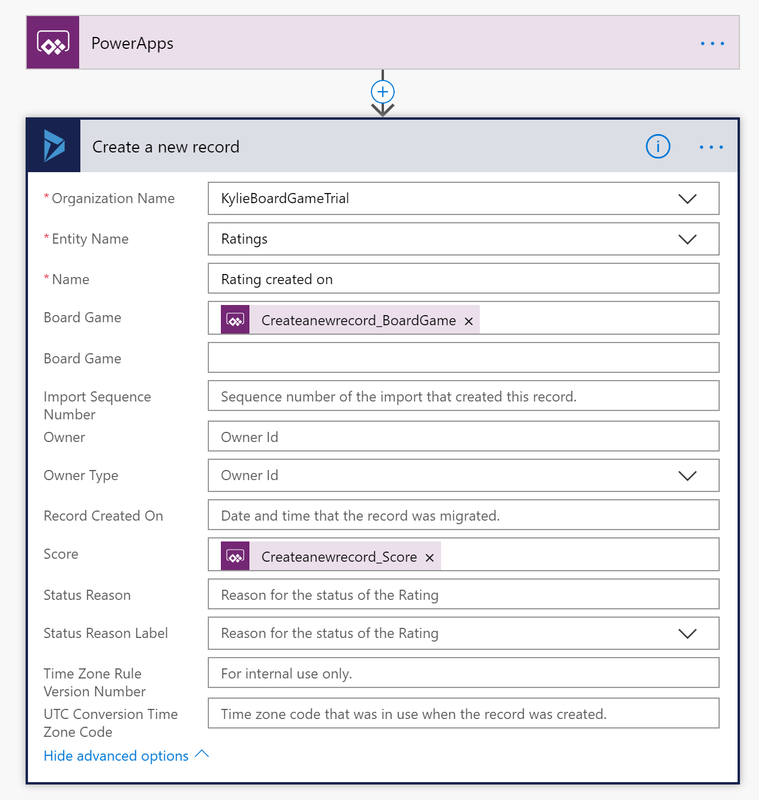 To test this, I downloaded the PowerApps app on my phone and logged in with my trial credentials. Then I was able to add ratings in the same way as when I was testing on the PowerApps site. 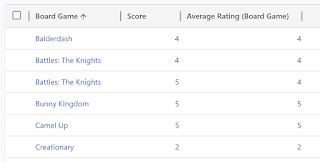 Finally, I went into Dynamics 365 and saw that the ratings were being added and were being rolled up at the Board Game level. Success! Now to see if any friends want to use this at Parties. Tomorrow we will finish this series with a look back at lessons learned and thoughts from this series. Don't miss it! I have been working with Microsoft Dynamics CRM since 2010. I enjoy learning new ways to customize the system, especially if it can be done without writing code. I aspire to becoming a CRM MVP, going to surf camp, and living on the beach.